Cystic neoplasms of pancreas represent less than 10 percent of all cystic lesions and less than 1 percent of all exocrine pancreatic neoplasms. They can be benign or malignant. Mucinous cystic neoplasms are the most common cystic pancreatic tumors accounting for 45 to 50 percent. These neoplasms have a natural evolution from benign to malignant form. Hence, once they are diagnosed, resection is the treatment of choice. 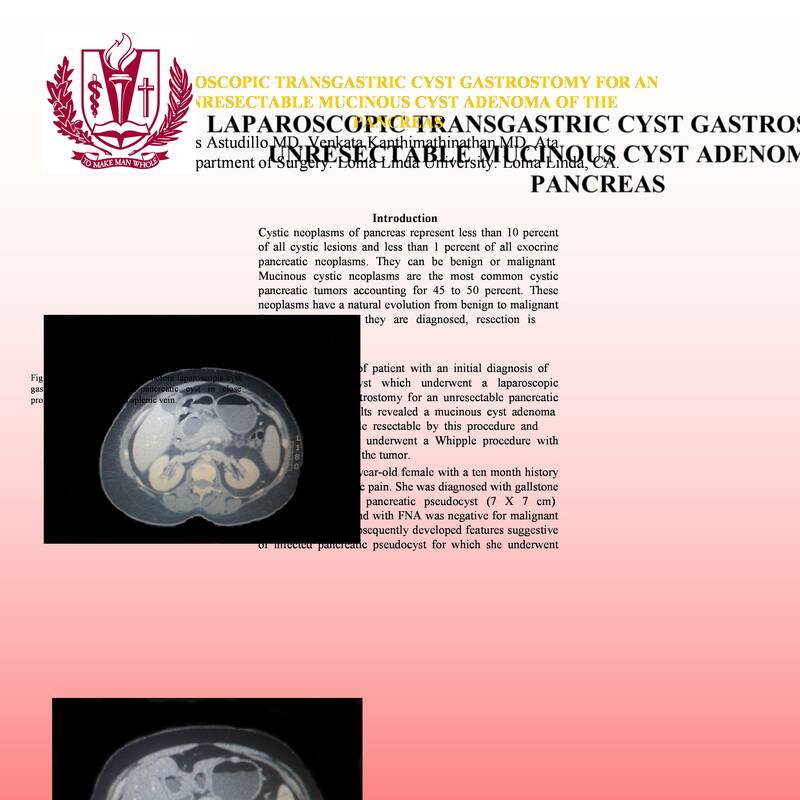 We present a case of patient with an initial diagnosis of a pancreatic pseudocyst which underwent a laparoscopic transgastric cyst gastrostomy for an unresectable pancreatic cyst. Pathology results revealed a mucinous cyst adenoma. The tumor was made resectable by this procedure and the patient subsequently underwent a Whipple procedure with complete excision of the tumor. The patient is a 47 year-old female with a ten month history of recurrent epigastric pain. She was diagnosed with gallstone pancreatitis with a pancreatic pseudocyst (7 X 7 cm). Endoscopic ultrasound with FNA was negative for malignant cells. The patient subsequently developed features suggestive of infected pancreatic pseudocyst for which she underwent laparoscopic transgastric pancreatic cyst gastrostomy. Pathology of the cyst wall was reported as mucinous cyst adenoma. She was subsequently referred to surgical oncologist who then decided to resect the neoplasm. CT scan showed complete resolution of the cyst and the pancreas appeared normal. The patient subsequently underwent a Whipple procedure. Intraoperative ultrasound did not show any cystic lesions in the rest of the pancreas. The patient was discharged on postoperative day 12 after an uneventful course. Laparoscopic transgastric pancreatic cyst gastrostomy is a good option for the management of pancreatic cyst. The use of this technique resulted in complete resolution of the cyst, thereby making the cyst resectable.